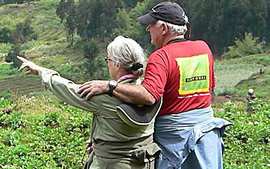 This 14 Days Uganda safari is a customized travel package combining gorilla trekking and Wildlife viewing. Enjoy game viewing in Kidepo Valley & Queen Elizabeth national park, trek chimpanzees in Kibale forest national park, gorilla tracking in Bwindi and a forest walk at lake Bunyonyi. The tour starts and ends in Uganda. Day 1: Arrival in Entebbe and transfer to 2Friends hotel for morning rest. Day 5: Chimp tracking and Transfer to Queen Elizabeth NP and afternoon boat cruise. Day 8: Transfer to L. Bunyonyi and afternoon nature walk at the island. Day 10: Nature walk to the Salt licks and afternoon game drive. Day 13:: Return to Entebbe and transfer to 2 Friends hotel. walk to the Karamajong village. the Karamajong village. Overnight at Apoka Safari lodge. Day 3: Fly back to Entebbe and transfer to Kampala. Day 4: Transfer to Kibale Forest NP. 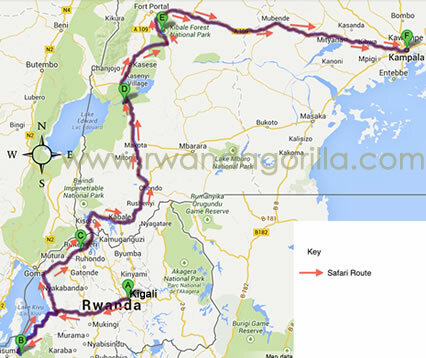 Day 6: Transfer to Bwindi NP with en route game drive for Tree Climbing lions. Day 7: Gorilla Tracking and community tour. community walk to the Batwa village and later transfer to L. Bunyonyi. Overnight at Bunyonyi Ecoresort hotel. Day 9: Transfer to L. Mburo NP for an afternoon game drive. about USD70 for 2 hrs). Day 11: Transfer to Entebbe for a ferry to Ssese Island via Entebbe. Day 12: Full day at Ssese Island. the guide will take you around Entebbe before dropping you at 2 Friends hotel.